Wow, almost everyone I know has been to G-Men Ramen. It has taken me that long to give it a try. No, it's not because of being located in Richmond. That has nothing to do with it. Honest! One reason is that Viv doesn't really like ramen all that much. Second, my son doesn't like ramen all that much. But I like ramen very much! So ultimately, it would be a solo jaunt for G-Men. Opened up by the people who operate Gyoza King, it has been so popular, there is usually a lineup. For me, I hate lineups. Thus, I made it a point to arrive as it opened. Now, I'm a big fan of tonkatsu broth and for some reason or another, they only have chicken broth during lunch time. The ramen itself was done al dente and had that "bite" we all look for in fresh noodles. The pork slices were fatty and tender; yet not all that tasty. Probably because it was sliced super thin. 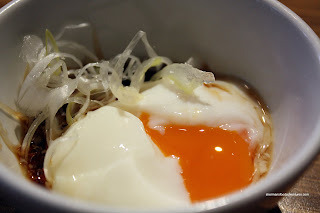 I did like the Ajitama (cooked egg with a golden centre), it was perfect. The shoyu chicken broth was quite oily and rich. Lacking the depth of a tonkatsu broth, the oil slick at the top helped give the soup some body. It was a bit on the salty side (maybe too much shoyu? ); but at the very least it made up for the "lightness" associated with chicken broth. 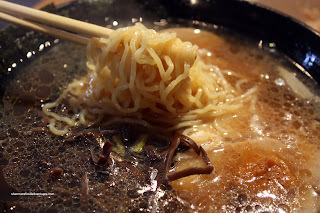 A solid bowl of ramen; however, I much prefer the tonkotsu broth, which is not available during lunch and vice versa. For me G-Men was alright. 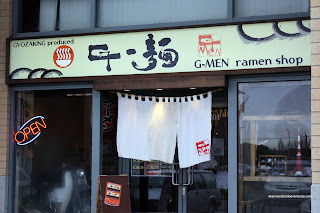 If I was in the area, I might stop by again; but if I had a choice, it would still be Menya, Benkei or Kintaro. LOL... Yes, that's right! I keep making that mistake, thanks for pointing it out! 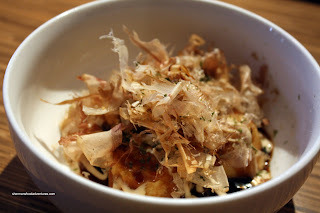 I can't agree with you more on the Takoyaki, I hate the fact that it's luke warm... it felt microwaved than freshly prepared.